When people think of comic books the usual suspects come to mind, Batman, Spiderman, The Avengers, however pay a visit to the wonderful Page 45 – situated a few doors down from where the much missed Seletadisc used to trade on Market Street – and you will be introduced to a whole new, fantastic and amazing world of comic books and graphic novels full of autobiography, crime, comedy, politics, travel and indeed fantasy. Stephen Holland, the co-founder of Page 45, is as passionate a person as you will meet, spend a few minutes talking to him about comics and the love and enthusiasm he has radiates from him, comic books are not just Stephen’s job, there is love and that is what makes this such an amazing place. 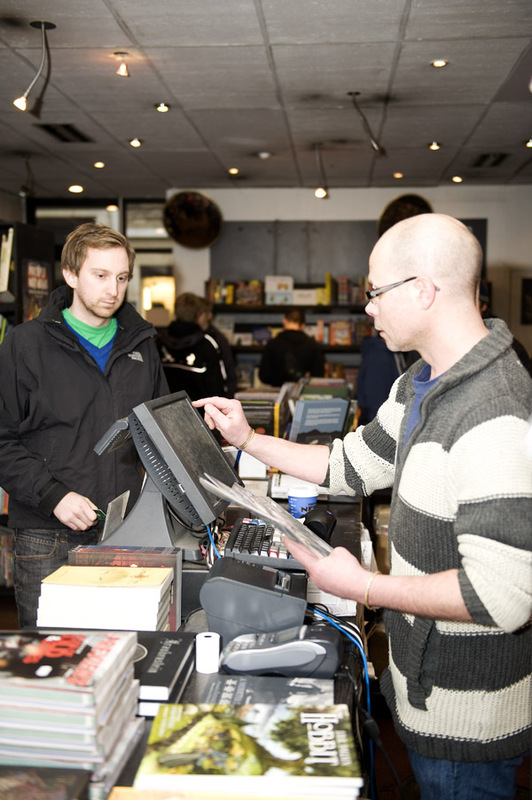 Despite being the co-creator and manager Stephen prefers to spend his time where the action is, on the shop floor mixing with the customers, discussing the latest releases and imparting his expert knowledge on what to pick up, it really is a pleasure to watch him work. 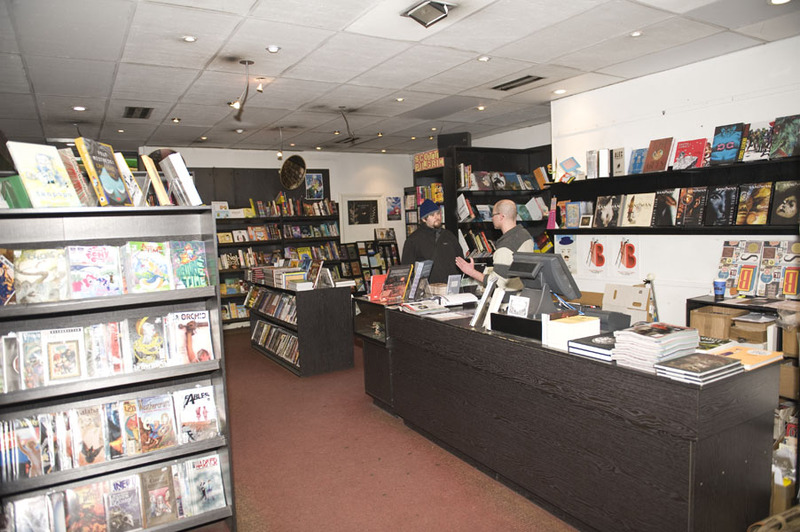 Unlike the chain stores like Forbidden Planet, which stock comics as little more than an side arm of their business, Page 45 is a true comic store, but you won’t just find your usual superhero comics within its walls, in fact the likes of Superman and The X-Men are tucked away in the corner, after all, as Stephen says “superheroes get enough attention already”. Instead Page 45 gives its focus over to a whole spectrum of comics and graphic novels from across the world, various styles, designs and genres covered, all displayed beautifully and with the love of somebody that knows that comic books are not just stories but are art, and like any art the variety’s are endless, some of the collections on offer are stunning, from gothic line art to large, bright colourful designs just browsing the shop is a pleasure in itself as I discovered upon my first ever visit to the store. Stephen has been running Page 45 for nearly eighteen years, jokingly adding “clearly I was five when it opened”, having initially started it with his original business partner Mark Simpson back in 1994. When Mark sadly passed away in 2005 Stephen continued to run things alone, however he now has a new team involved – new business partner Jonathan Rigby and original Page 45 member Dominique Kidd returned yet again – that has allowed the store to grow, the most telling improvement being the stores brilliant website (www.page45.com) that allows Page45 to reach out across the globe. Stephen is fully aware of the importance of the website, despite maintaining that the in store shopping experience will always be number one for him. “For me the shopping experience has to be hands on. I love visiting stores, I love holding these artefacts and leafing through them, but some people don’t and you have to respect that. Also if you want to sell to someone in Tibet you kind of have to have a website”. Despite that, for many it is the experience of visiting the store itself that matters and people will travel from across the country to pay the store a visit, and sometimes they will travel from even further. 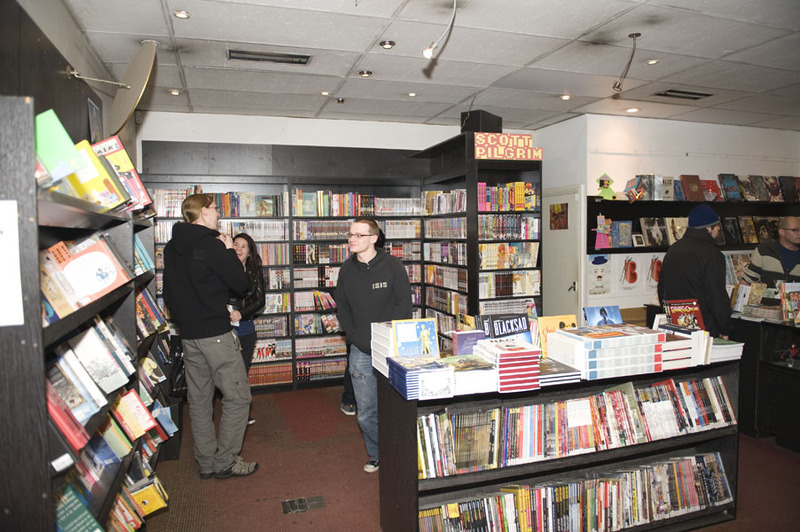 That, is one of the keys, comic books and graphic novels are a culture, unlike most city centre stores Page 45 is not a shop you simply nip into while in town, it is a store you make the effort to go out to, it’s a destination store, something that helped it when the city centre was in the midst of upheaval a few years back. 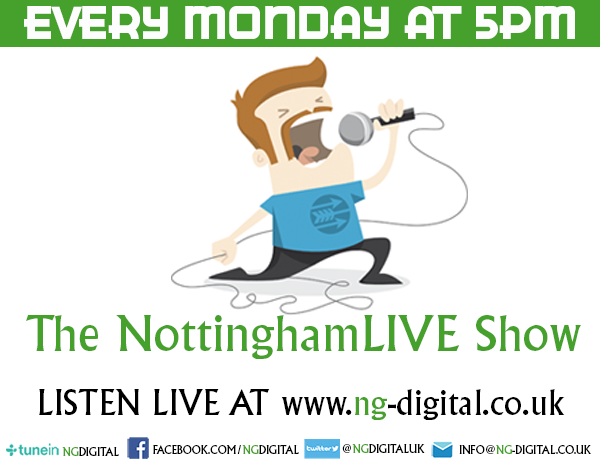 “When Nottingham City Council imposed the tram on Nottingham, without a thought to the impact on independent business, some, like the tobacconist down the road went out of business because people wouldn’t walk the extra twenty yards around the works to visit. All the council had to do was offer a rates reduction to help these businesses through that sticky period, but they refused. They offered a rebate a year after the fact if you could prove your takings were down. Too late: the tobacconist was dead in the water. Luckily people will make that extra effort to visit us. I cannot begin to tell you how grateful I am”. Thanks to this dedicated fan base, and the hard work and passion of those running it Page 45 has managed to survive despite the current economic turmoil that has ripped through much of the retail world, the store is thriving and five minutes in there it isn’t hard to see why. Throughout our chat Stephen has to break off to serve customers and it is here you see a man who really loves what he is doing, chatting away to customers, answering questions with enthusiasm and incredible knowledge, in an age when we are used to the simple serve, pay and leave style of chain stores this personal, passionate treatment is something to saviour. Comic books are a culture, like music, art, film they are about much more than just the end project and Page 45 is like the hub of that culture. If you’re not a comic book lover however I’d implore you to get along to the store anyway because you will soon learn that there is a lot more to graphic novels and comics than just a good guy and a bad guy fighting, there are tales of beauty, heartbreak and even poems. 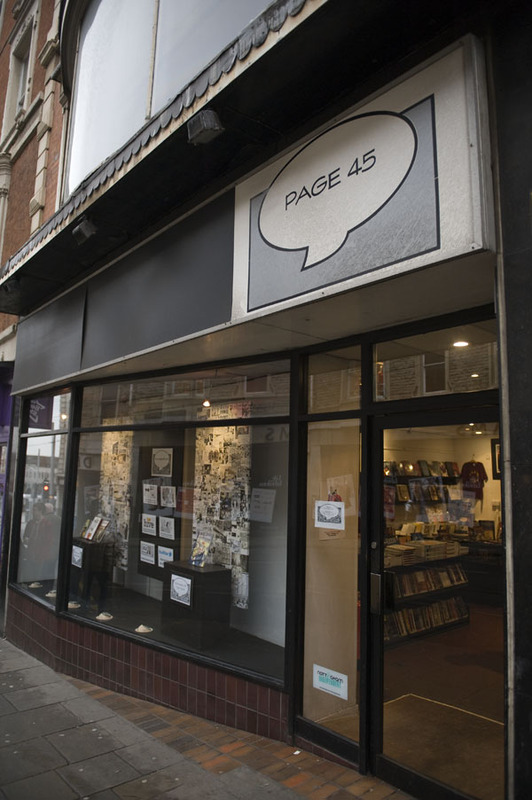 Page 45 is without a doubt a must visit place in Nottingham and a place we should treasure and support as a part of our rich, wonderful creative community. 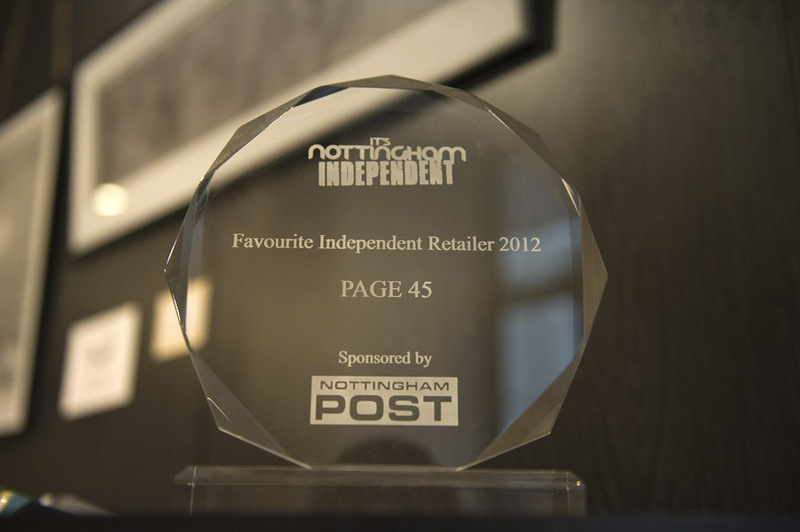 It won the first ever award for Best Independent Retailer in Nottingham in 2013. I recommend Locke & Key, Fables & Sandman. All good in the hood.